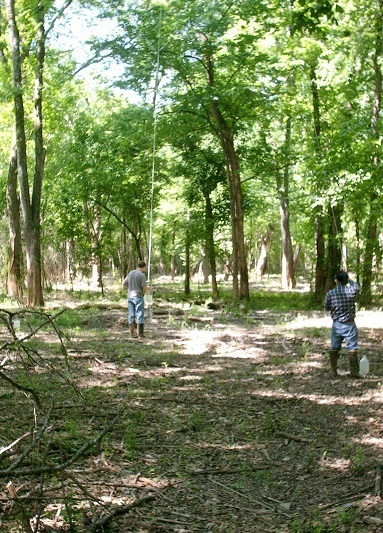 Results from a five-year study published in 2014 by U.S. Forest Service researchers showed that not only can a thorough removal of privet last at least five years without a follow-up, but also that native plant and animal communities steadily return to areas cleared of the invasive shrub. 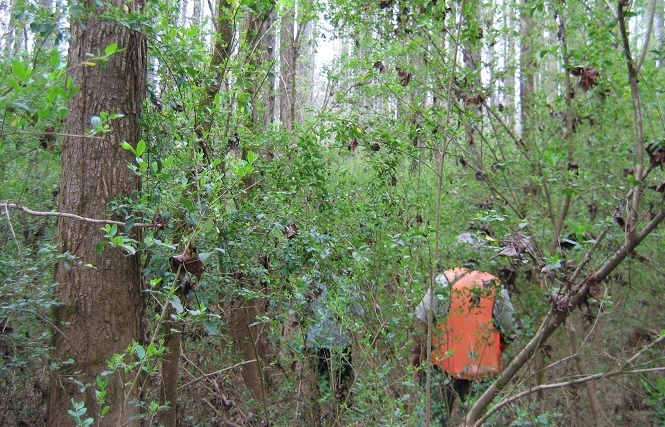 In 2005, Forest Service Southern Research Station (SRS) and State and Private Forestry started an experiment to assess the long-term effects of removing Chinese privet from streamside forest land in northern Georgia. SRS research entomologist Jim Hanula (recently retired) and entomologist Scott Horn, both based in Athens, Georgia, as part of the SRS Insects, Diseases, and Invasive Plants unit, worked with John Taylor (retired, Forest Service, Region 8, State and Private Forestry) to set up plots to test methods of removing privet and to document the return of native plant communities and the response of insect pollinators. Researchers in a 40-year-old privet stand in the forest. Photo courtesy of the U.S. Forest Service. Hanula and Horn began investigating how privet removal affected the recovery of plant and animal communities by comparing the treated plots to reference areas that had never been invaded by privet and control plots that were invaded and not treated. They published their initial findings on plant communities two years after control in 2010. In 2014, five years after treatment, University of Georgia graduate student Jacob Hudson, along with Hanula and Horn, published an article in the journal Biological Conservation documenting the continued long-term benefits of removing privet to both bees and butterflies. In an additional article published in the journal Forest Ecology and Management, Hudson, Hanula and Horn also reported on the status of plant communities and the growth of canopy trees five years after the complete removal of privet. This is one of the longest studies on the effects on forests of removing invasive plants. 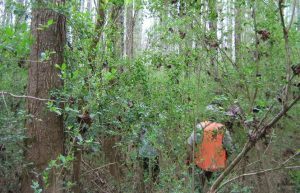 Read about privet removal effects on plant communities and canopy trees. Read about privet removal effects on pollinators.